So we have finally started our coop for our 6 Silver Laced Wyandottes. Our goal with the chickens is to have as little invested as possible so that the benfit of the meat and eggs truly is a financial benefit. To this end we are making the coop from recycled, left over and home milled lumber. We also want to teach our girls the lessons of self sufficiency and frugalness. 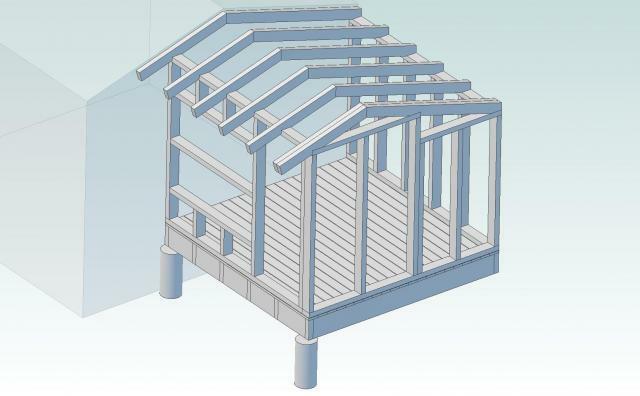 The coop will be 7' x 7' and sits approximately 16" off of the ground for most of the coop. 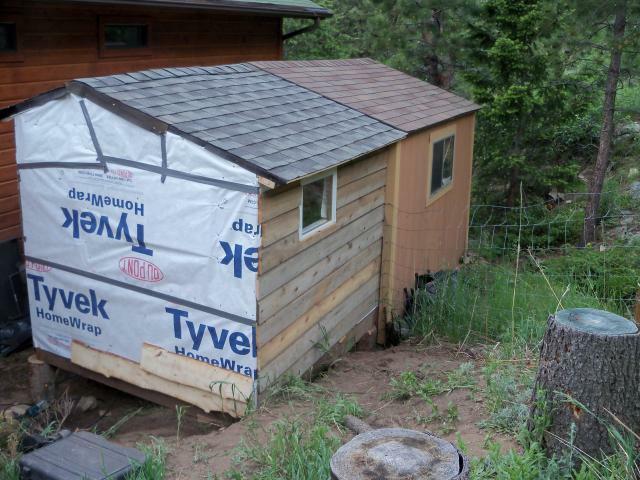 The maximum inside height will be about 6'2" which will cause me to stoop some when inside but I wanted to use our existing shed as the backwall to cut down on the amount of materials that we would need. 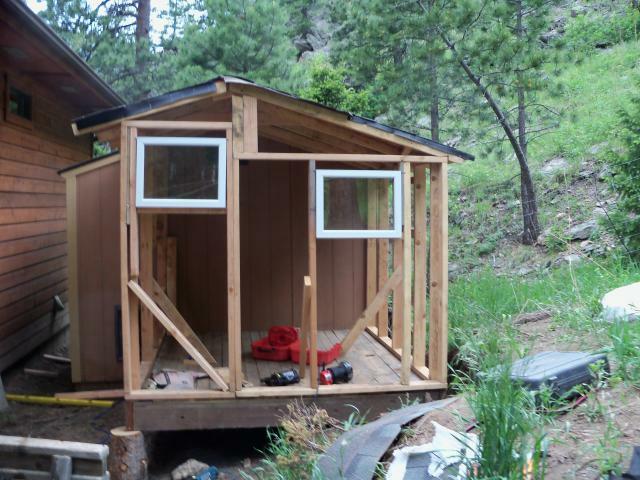 We will try to keep pictures posted regularly as we work on the coop over the next several weeks. Unfortunately I travel throughout the week and so we only get a couple of days a week to work on this. As we live in the mountains we have the wonderful pleasure of working around the contours of our property as well as a number of small and large predators including foxes, bears and mountain lions. couple of weeks ago the bear tore the gate off of the fence and actually ripped some of the lumber to shreds in the process and bent the 3/8" diameter steel latch to the point I had to hammer it straight. She was not happy to wake up to find that it was still snowing. 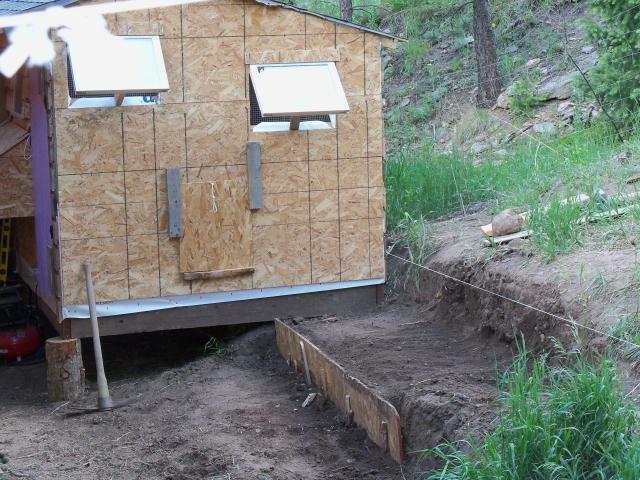 The foundation of the coop is made from 2" x 8" cedar boards setting either on 10" diameter pine sections or on granite. We still have a lot of earth to move to make the run but wanted to start with the coop and then go from there. This weekend we got the decking in place. We used left over 1 x 4 and 1 x 8 boards from another project that we worked a couple of years ago. They have been out in the weather and snow for a couple of winters and therefore weren't very straight or flat but worked great for our rustic approach to building our coop. Since we are planning to use the deep litter method we aren't too worried about the small gaps between some of the boards. 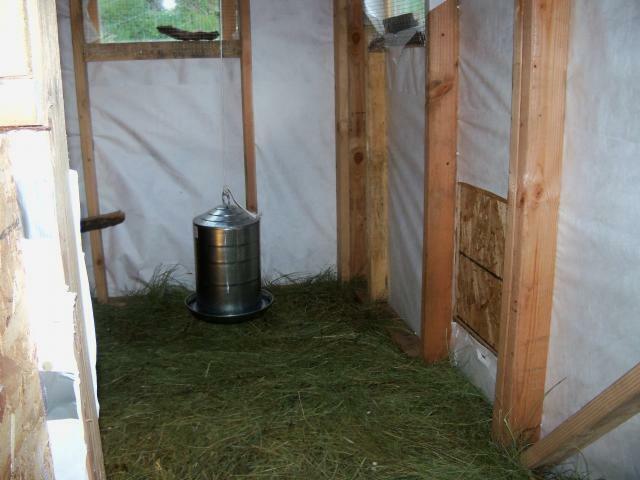 We will also be insulating under the floor of the coop and then covering the insulation so that the hens won't be tempted to peck at it whenever they get under the coop. You can also see our portable chainsaw mill and a couple of the boards that we milled today from some of our trees. From this point on all of the lumber will be milled from pines that are located on our property and have died standing. 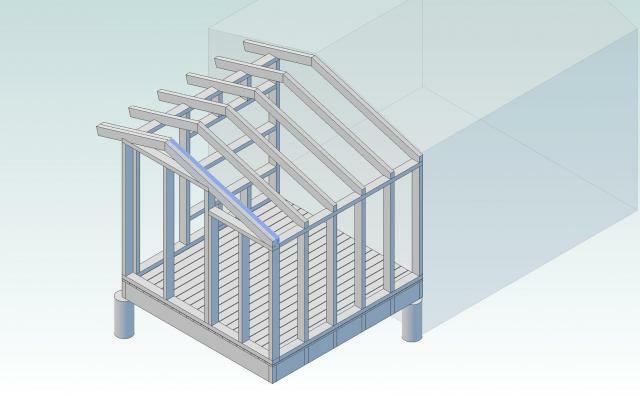 We are expecting to mill of the remaining lumber for the coop and also plan to make our own wooden shakes for the roof. We probably will cheat though and use fiberglass insualtion covered with sheetrock as we have quite a few sheets of drywall left over from another remodel. 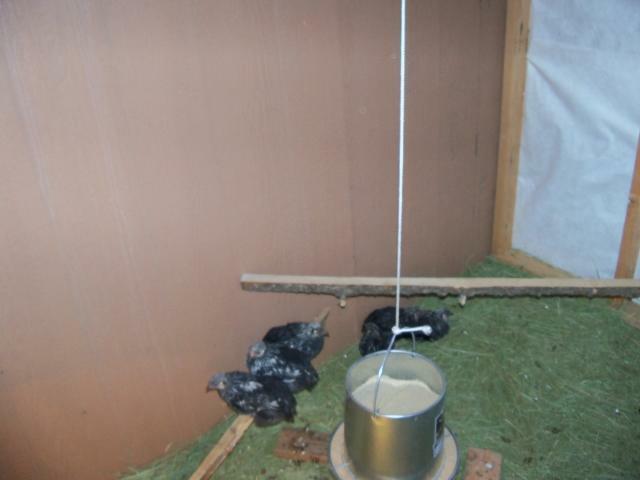 BTW, the one corner that does not have a pine log showing actually sits on a large granite rock as it is where the mountain comes down on the corner of the coop. It is raised a couple of inches above grade and is securely situated so it should not give us any problems. Well we finally have finished the coop. Due to some issues with our chainsaw mill and my travel schedule keeping me gone most of the last 4 or 5 weeks I had to resort to using some purchased lumber and left over materials from other projects to finish the coop to the point we could put the girls inside. We got the walls erected and the roof installed. Originally we planned to use wooden shakes for the roof but wound up using some left over shingles from another project due to our time crunch. We did use some of our home milled lumber for the rafters. 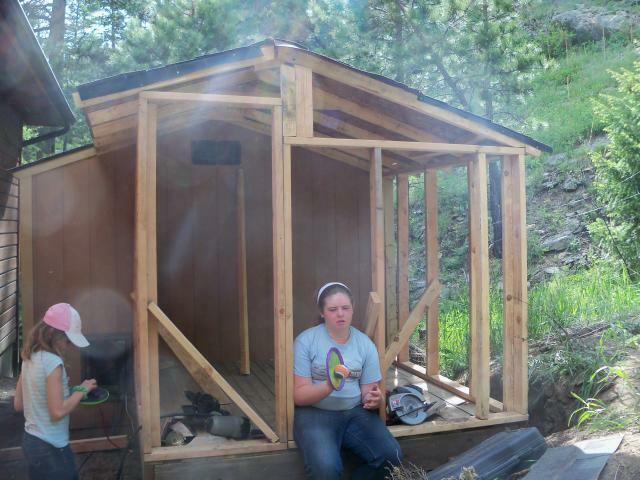 Here you can see our two oldest daughters helping with the construction. 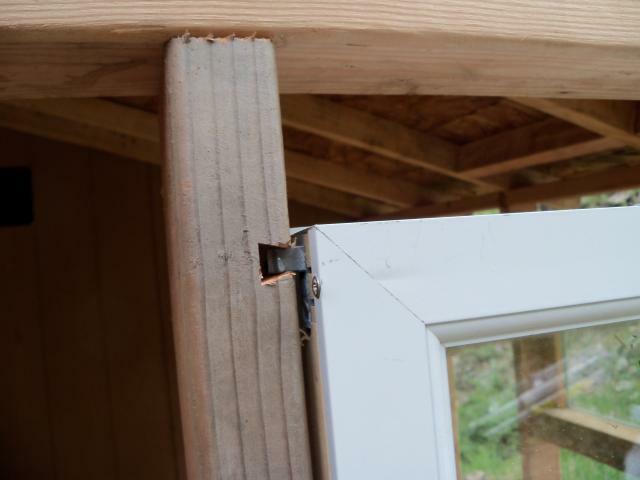 We were able to find some window panes at the local Habitat for Humanity Restore and made them work by milling some dove-tail slots into the rough opening for the window that the panes can pivot on. The windows were originally part of a swing out set and so there were no frames with them but we got them all for less than $40. They are nice vinly clad, double pane windows that will provide good light in the winter while being fairly insulated. 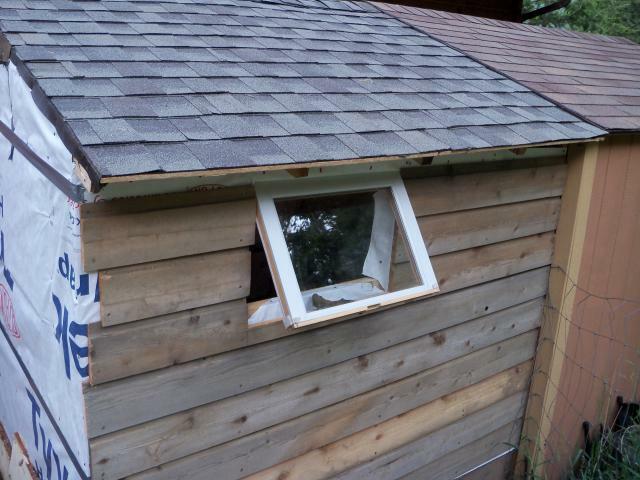 When the siding is installed over the window the pins will be captured in the groove and won't be able to come out. Once the windows were installed we wrapped the whole structure in TyVek house wrap to keep the drafts to a minimum. After the wrap was installed we started installing the siding that we had left over from some home remodeling we did a couple of years ago. This went on the north wall which is the least visible wall from the house. We will be installing home milled siding on the east and south walls. You can see a couple of pieces installed on the bottom of the wall. 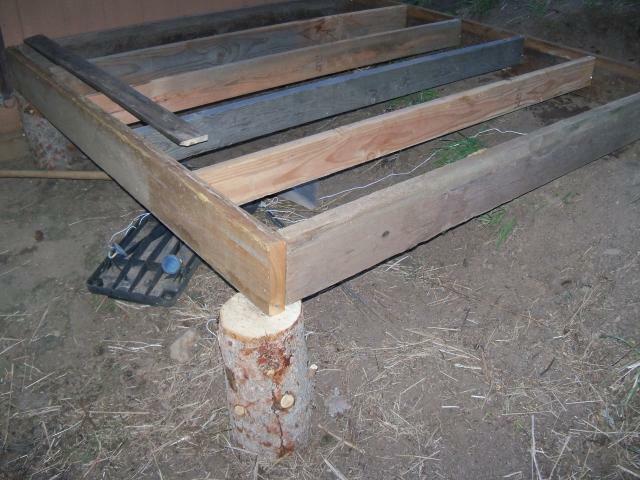 This is when we started having major problems with the chain saw mill and had to come up with another plan to get the rest of the coop ready to put the chickens in as they were starting to get a little smelly in the house. You can see how the windows open. Currently we are just using a stick to prop them open. The finished window openings are covered with hardware cloth on the inside so that nothing can get in or out! 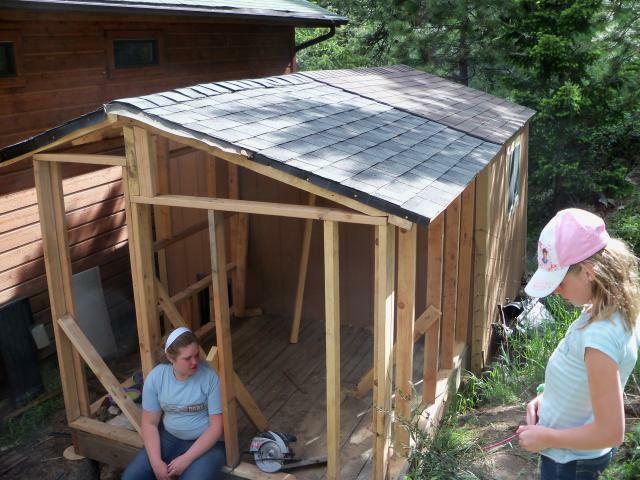 After we realized that we would not get all of the siding cut in time we decided to cover the remaining walls with OSB. We will be covering the OSB with siding as we get it cut. You can just see the external nest box on the edge of the picture. The nest box is divided into three sections aboiut 12" wide and 16" deep and 14 to 18" high. The lid that opens will be covered with the same shingles as on the roof using liquid nails so that we don't have to worry about any stray nails or screws poking through the lid into the nests. We will put some hay in there for the girls to make their nests in. My kids say that the coop is alive as it has two eyes and a big mouth where the chicken door is. 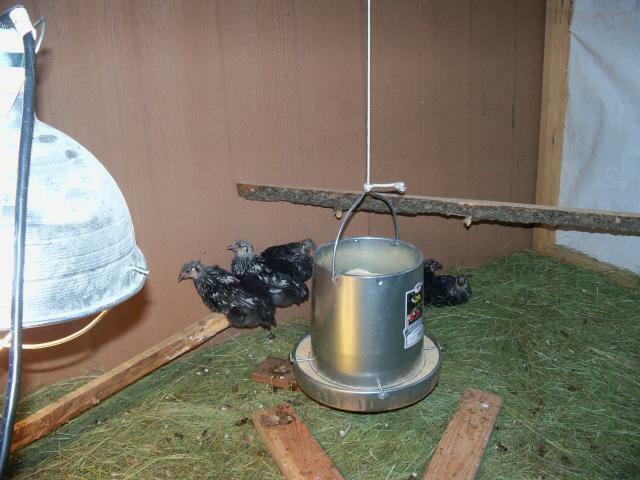 They say it looks like the coop is eating the chickens just like we will one day. You can also see where we are terracing the run area. We have already removed about a cubic yard of dirt and rocks from the area. We will be placing local stones that we are collecting from the mountain along the edges of the terrace sections to make them stable. The run will be 7' x 15' when complete. We have not finished the run yet but we went ahead and put the girls in there along with their 12# feeded and 3 gallon waterer. So far they are really loving the new space. We are using the deep litter method and have added 6" spacers in the doors so that as the litter builds up it won't fall out. 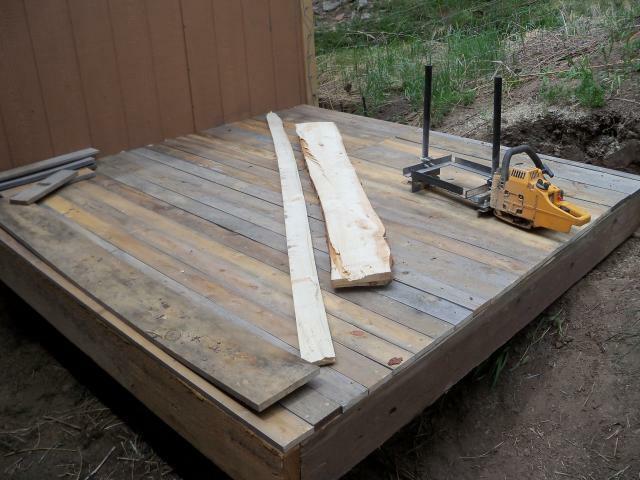 The big door as a removable partition so that when it is time to remove the litter in the spring we can remove the partition and easily rake it out into the waiting wheel barrow for the garden. Right now we have a couple of low roosts installed but will move them up as the chickens mature and then we will also add a brooder section so that we can raise the next set of chicks in the coop once they reach a couple of weeks of age until they are ready to join the flock. Start earlier than we did. With my job time is always at a premium. Install wiring in the walls for heat lamps, lights, etc. Install a sky-light or cupola so that on warm days we could open it up to vent better. We ahve four windows and open eaves but when the sun is shining directly onto the coop and can still get warm especially with the one "fixed" wall from the shed. I love that you did as much as possible with reusable parts. I'd love to see more about your roof/ vent build. Well done.